The EuroCup Semi Finals or the 7DAYS EuroCup is a popular European basketball tournament that consists of 24 professional men’s basketball clubs. The tournament consists of 24 teams competing for the championship title in one of the most popular sports events in Europe. 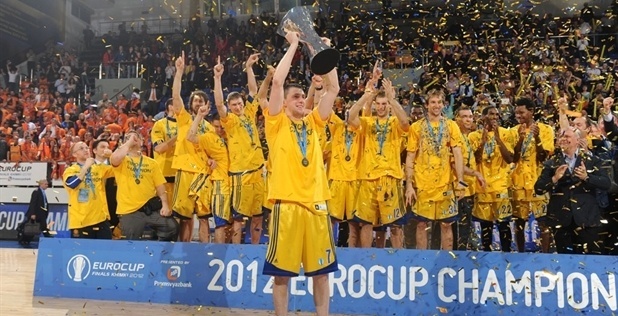 The EuroCup competition is currently in its 17th season and it was renamed 11 seasons ago from ULEB Cup to EuroCup. The semi finals are going to be held across a period of time from the 19th of March to 27th of March. You can follow all EuroCup semi final matches and other basketball tournaments right here on xscores.com. The EuroCup semi final matches are scheduled in three legs. The first stage will take place on the 19th, the second stage on the 22nd, and the third and final stage of the semi finals is scheduled for the 27th of March. After the 27th, we will know which teams will proceed to the EuroCup finals, which also consist of three legs scheduled from 9th of April to 15th of April. The teams that will face a new challenge in the semi finals include Alba Berlin who are going against Morabanc Andorra, as well as Valencia Basket who will face UNICS throughout these three legs. The defending champions of the EuroCup, Darussafaka, have not made it to the semi final stage, which means this year we will have a new basketball champion taking over the European stage. Valencia is one of the most successful clubs of the competition, as they have won the most championship titles. This makes them the current favorites in the competition. If you are excited about the EuroCup semi finals, you can follow all upcoming matches, live scores, and statistics on xscores.com. Make sure to check back regularly for immediately updated live scores and fixtures.